Anthony Bourdain may be the best-traveled person alive. Here the host of CNN's Parts Unknown and F&W's brand-new Illustrator-in-Residence shares three singular experiences. In an open-air market in Yangon, the former capital of Myanmar, I saw a woman squatting by an open fire in the street, preparing mohinga in a simmering wok, her components in baskets around her (left). Mohinga is ubiquitous, one of the most beloved and iconic dishes you'll find in Myanmar: The base is a rich, darkly sinister fish broth, served with rice noodles and an array of garnishes that contribute highly complex flavors (sweet, sour, spicy, savory) and textures (soft, chewy, crispy, crunchy). Though I saw it most often in the morning, anytime—breakfast, lunch or dinner—is mohinga time. The man roasting coffee beans in the sketch (right) was one of the Palestinian elders I met outside Gaza City who gathered each evening to discuss community matters. He was unfailingly hospitable, insisting on preparing me coffee as soon as I arrived. He ground the beans in a makeshift mortar and pestle, then brewed the coffee next to the fire. It tortured him to see my camera crew working, unfed, while we ate a roasted melon salad. The coffee was delicious: strong, thick, heavily spiced with cardamom. It tasted like hospitality. At all times, tasting the strong, fresh, slightly bitter black grounds reminded you of exactly where you were. 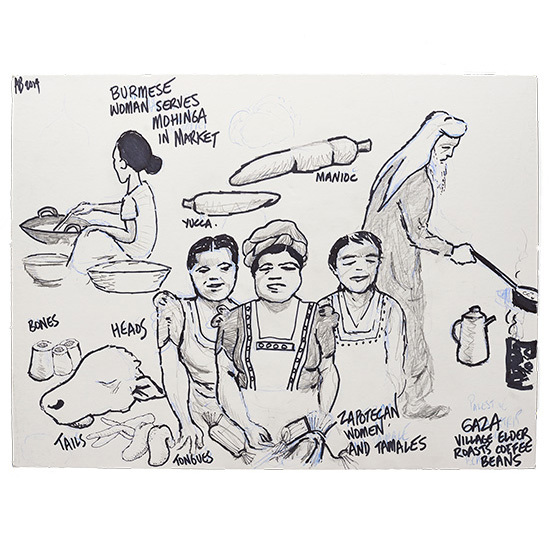 The women known as Las Hermanas Zapotecas ("The Zapotec Sisters"), who have a restaurant and crafts shop in a village outside Oaxaca, inspired my drawing (center). They prepare indigenous dishes using the time-consuming processes of hand-grinding on stone and cooking on a comal (griddle). This is slow food at its most literal: Some moles simmer for 12 hours, and that's after all the grinding. I noticed the women had tiny, rough but delicate-looking hands and huge, powerful forearms from years of hand-grinding masa and chiles. It was extraordinary to see them work. They were very proud. I hope that shows in my sketch. Anthony Bourdain and Eric Ripert Talk Food Trends: Good or Evil?